We’d love your help. Let us know what’s wrong with this preview of The Only Kayak by Kim Heacox. Finalist for the 2006 Pen Center USA Western award in creative nonfiction. To ask other readers questions about The Only Kayak, please sign up. did it win any awards, etc? This book startled me. First - the author's voice. Kim is fully and completely open as he describes how a place brought about his metamorphosis. His honesty and authenticity commanded my attention. Even more impressive is his conviction. Kim describes how his experiences led to him becoming a 'conservationalist,' and he doesn't mince words about the sadness and challenges that came with standing on those convictions. This story has kept me up at night since I finished reading it. The courage it This book startled me. First - the author's voice. Kim is fully and completely open as he describes how a place brought about his metamorphosis. His honesty and authenticity commanded my attention. Even more impressive is his conviction. Kim describes how his experiences led to him becoming a 'conservationalist,' and he doesn't mince words about the sadness and challenges that came with standing on those convictions. This story has kept me up at night since I finished reading it. The courage it takes to stand on that line moved me. Kim lost some important friendships because of those convictions. That place were two people can't see eye to eye...where it is impossible to span the divide between opposing convictions - is deeply sad - but at the same time, profoundly courageous. Finally - this story strikes at something deeply personal - it gives voice to a collection of my experiences and musings regarding life in Southeast Alaska and our relationship with the natural world. It resurrected memories of hypocrisy as I witnessed a culture that once lived with deep respect for the land, but today has clearcut and raped that same land in the name of profit, leaving an ugly wasteland. Today, that same drive for profit has depleted our oceans and rivers, and I am a part of this process. Big halibut used to be the norm when fishing around Prince of Wales...but are now the exception. How many salmon did we happily fill our freezer with...only to sit there until freezer-burn took over because we took too many. How many good people and their families depend on livelihoods that do not respect the land that sustains us? He insightfully questions what it means to be a part of modern society but still long for open spaces, to experience wildness, to be a human in the midst of a world so inhuman. It's one of the most profound works of philosophy and poetry I've encountered in a coming of age story. He somehow manages to capture the stunningly visual landscape of Alaska into a verbal dialect that is a conversation with the reader but it's so astoundingly thoughtful that you f One of the best books I have ever read. He somehow manages to capture the stunningly visual landscape of Alaska into a verbal dialect that is a conversation with the reader but it's so astoundingly thoughtful that you feel like you are reading a photograph. I can't describe this the way I want. He takes you on a journey of discovering self inside a changing landscape that is a mirror image of the inner psychological, emotional, and spiritual questions we all try to understand. He manages to illuminate the mystery and wonder of Alaska. From the first sentence—"I live in the sunlight of friends and the shadows of glaciers"—this book is a uniquely descriptive and often-gripping tate of Heacox's life in Glacier Bay, Alaska. The book spins around a dichotomy I find so compelling: Outdoor adventure is about finding natural wonders, far from civilization, but it's also about the people you seek it with. This is a wonderful book! The author combines some of his personal background and story with the natural and political history of Alaska. Heacox is a beautiful writer, and his love for the great wilderness shines through, as does his pain over some of the inexorable changes that are taking place there (and all over our great earth). While nothing like it, the quality and passion of Heacox's writing remind me of the great "citizen writer" Terry Tempest Williams. I purchased this book while on a cruise to Alaska, so being able to actually see the sites that Heacox was referencing was wonderful. It was an insightful book that got me to think about my role in interacting with Mother Nature, even if my home base is 5,000 miles from Alaska. There were times when I had to keep track of the timeshifting nature of the prose, but overall it was a very enjoyable read. Wow. I loved this book - part memoir on Heacox's life in Alaska, part meditation on the changing landscape of Alaska, part essay/soulful plea for conservation of our wilderness, part story of gratitude for family and love. It's also a story of moving from grief (over the land and over the loss of a dear friend) to gratitude. Heacox's love for the wilderness runs deep and is contagious; I was moved by his writing. This is an incredible nonfiction account of a person learning to love living in Alaska. I have been to Alaska, and was caught up by its natural beauty, but The Only Kayak let me see it in even more depth. Making the account more enjoyable, it is written in the style of John McPhee, one of my favorite authors. Thought provoking. I really didn't enjoy the first half/two-thirds of this book, but the end mostly redeemed it. At times preachy, forced, and not at all A journey like indicated on the cover, it hits on some of the disonannce related to wanting to be in the wild but not affect it. This is a brilliant and beautiful book. You should go read it, right now. Kim shares his profound understanding of what is most important; the earth we live on and the people we share it with. One of the most important books I have read in a long time. A very personal book. A good read, but I think he missed an opportunity here to tell a more important story. This is such a good book. Non-fiction at its best. While reading this he spoke of a photographer from Japan and I wondered if he was the same one I read about in The Blue Bear. It turned out it was. I am going to read more of Kim Heacox books. Kim Heacox, a guitar playing Beatles fan who carries a well worn copy of the Great Gatsby and wants to be a photographer and writer, finds himself along with his friend Richard in the only kayak in the vast waters off Glacier Bay, Alaska while employed by the National Park Service. Kim shares 25 years of his life as he recounts the friendships made and lost, his marriage and the changes that are inevitable in wanting the share the beauty of a place yet keep it the same. This book caught my eye since a friend of mine expressed an interest in kayaking and I thought I’d like to try it myself. I don’t think this book will help as it’s not a how to on to kayaking, but it is a beautiful memoir on the author’s life in a place he finds beautiful and wishes to remain that way. I also like how the author recognizes his own shortcomings as he feels cruise ships may be destroying the land yet finds himself working on one and also wants to publish a coffee table photo book yet recognizes the number of trees that may have to be cut down in order to share images of the land he loves. I loved every moment of this book including the sad parts. The author takes us on a true journey of the Alaskan Wilderness. He gives you the feeling of truly being a part of Alaska. This is the Alaska I want to catch a glimpse of when I visit there. I want to see the wilderness. I have not been one to read much non-fiction but the life this man shows us in the book makes you want to be part of it, one with nature. God made all creatures humans being last we always want to make it about us (humans I loved every moment of this book including the sad parts. The author takes us on a true journey of the Alaskan Wilderness. He gives you the feeling of truly being a part of Alaska. This is the Alaska I want to catch a glimpse of when I visit there. I want to see the wilderness. I have not been one to read much non-fiction but the life this man shows us in the book makes you want to be part of it, one with nature. God made all creatures humans being last we always want to make it about us (humans) but some things were meant to stay the same and change naturally not to be changed by us. I wasn't sure what to expect with this book, I picked it up in Bar Harbor simply because of the title and cover photo - reading the back cover blurb confirmed it might be something I'd like. It was indeed. The author tells the story of coming to Glacier Bay, Alaska in the late '70s as a park ranger, falling in love with the place, and eventually settling there over the next few years. His 'only kayak' allegory appears several times throughout the book, to describe the changing appearance and fee I wasn't sure what to expect with this book, I picked it up in Bar Harbor simply because of the title and cover photo - reading the back cover blurb confirmed it might be something I'd like. It was indeed. The author tells the story of coming to Glacier Bay, Alaska in the late '70s as a park ranger, falling in love with the place, and eventually settling there over the next few years. It took me more than two years to read this, just because the author has such a captivating voice and a desperate story to tell. I wanted to ration the book and make it last as long as possible. I reread numerous passages, just for the emotional tone they conveyed about a place. Kim Heacox is definitely the equal of the great nature writers he constantly references. I imagine buying a few copies of this book for people I admire. 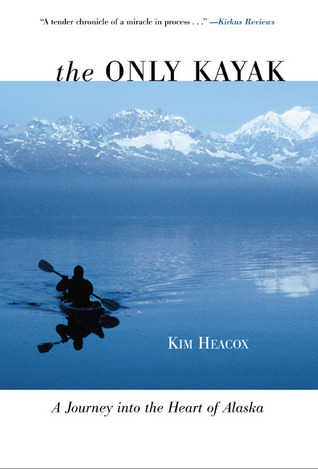 After an enlightening visit to Glacier Bay aboard the Sea Wolf tour & kayak support boat I picked up Kim Heacox's book on his personal connection with Alaska in general and Glacier Bay in particular. His writing is excellent as he relates what he saw and how it affected him in his 30 year history with the Glacier Bay National Park. His stories of the friends and acquaintances he gains along the way add a great note of humor and help bring his own personality into focus. I found this to be a pleasant reflection of life in Alaska by a guy that just seems like a very nice/thoughtful/community-oriented naturalist. It isn't full of crazy action/adventure (although there is some), but rather it conveys the beauty & dangers of Glacier Bay and explores what role people should take towards protecting the land. I especially enjoyed his interactions with photographer Michio Hoshino. This isn't "Into the Wild", but rather more like "Desert Solitaire". Bought and read this book a few years ago after friends vacationed in Glacier Bay. Re-read it after my own trip to Alaska earlier this month. Heacox's passionate love for the natural beauty of his adopted state is poetry as prose. The variety of his personal experiences living and working in Alaska give him a strong voice as a committed conservationist, who has long walked the walk, and feels a responsibility to talk the talk. A deeply moving portrait of a rapidly changing landscape. A beautiful memoir of his life in Alaska, covering years of developing a relationship, marrying and his life with his wife, traveling through the beautiful landscape, observations of the growing problem of environmental desecration and lack of policy, his love of children, and purchasing the land that once belonged to his late friend, Michio. This is the second Heacox book I have read. His prose is picturesque, sometimes poetic, and sometimes tragic. This book has made me grow to appreciate the many writers I was able to study in graduate school. Being able to picture John Muir and his dog makes their adventure even more true. Reading about Lynn Schooler and the death of "The Man from Japan" was even more real having already read The Blue Bear. I picked this up at a great bookstore in Alaska, don't remember which town. I fell in love with Heacox...again, him, Dillard, Ackerman, and Lopez. My favorite science nonfiction writers. In words they bring alive the most beautiful places on earth and make me feel like I've been there. Their words overwhelm me, move me, and I love them for that. Kim Heacox here searches his relationship to Glacier Bay National Park, the communities around it, Alaska's wilderness and our varied relationships to it, the sustaining nature of deep friendship. His honesty and generosity is to be appreciated and admired -- he here questions how to find "right living" in a complicated place for a complicated soul. Read it during our Alaska trip. It's a wonderful read by/about the author who loves Alaska and it's pristine wilderness. Beautiful descriptions of the country and the struggle to keep it wild vs bring tourists in who can be advocates for open space. A little love story in there too.